Chess in the Movies #2: Sorry Don't Get It Done, Dude. Capped off the report card / end of the school year madness with a four day holiday with the family (nothing fancy - we got off-season rates for a cottage on PEI - it was nice). I promise new chess info strips this week coming. I want to get out of the Kings and move on. Anyone get the movie reference? I've included the original strip I drew just because I felt pretty silly making John Wayne a rook instead of a knight (John Wayne = cowboy = horse = knight...duh). More King stuff to come, but I was still getting all of those end-of-the-year things done for school this week that I did not have time to get to the new stuff. I have had this one done for about a month but I was waiting for a good time to use it. I was also wondering if I would ever use it. I take seriously the No-Trash-Talking rule, but this one seemed so fun. Perfect for a mug. It is that most wonderful time of year. Oh well. I'm almost done. 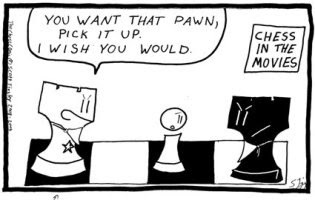 There will be a lot more Checkmate stuff coming - I think half of the strips have already been written and sketched already, but it isn't time for it yet. The other pieces need to be introduced before it can be properly dealt with. Don't worry, I'll get to it.